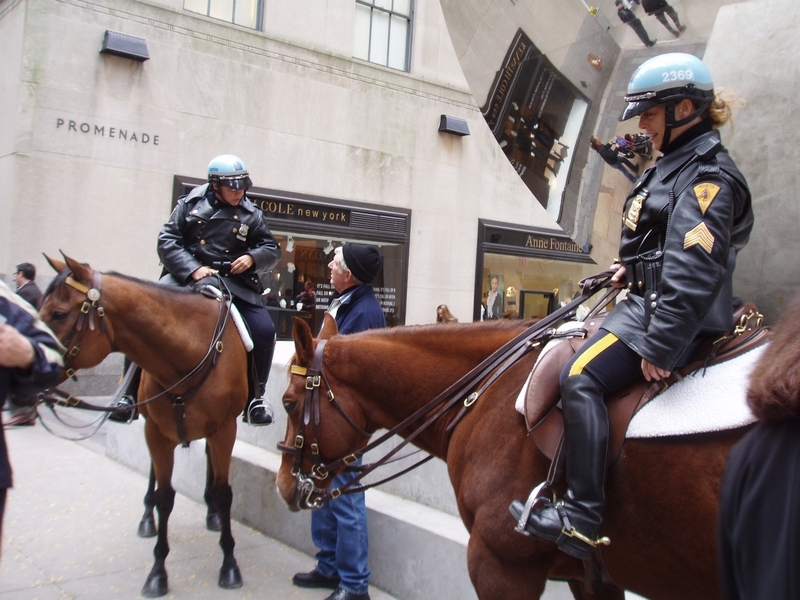 What does it mean to ‘Balance the Hoof’? 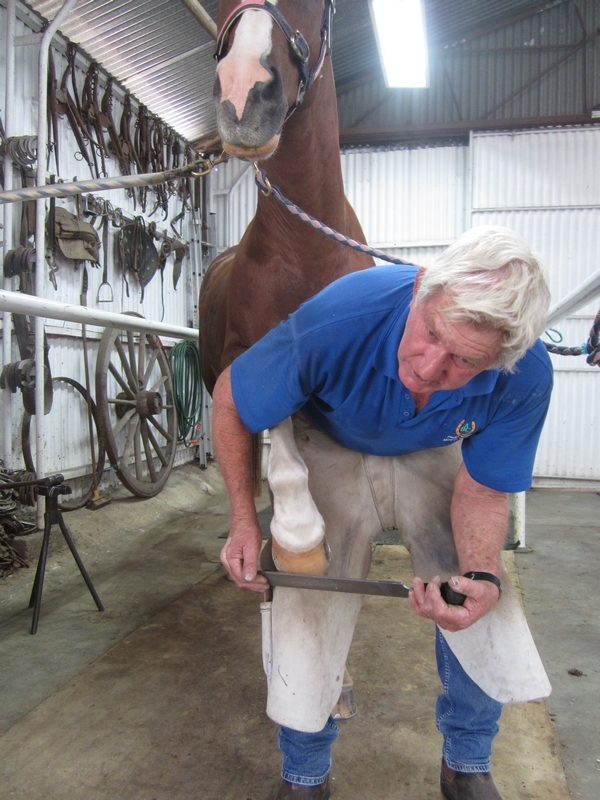 Ask any farrier if he balances the hoof and he will say ‘Yes’. 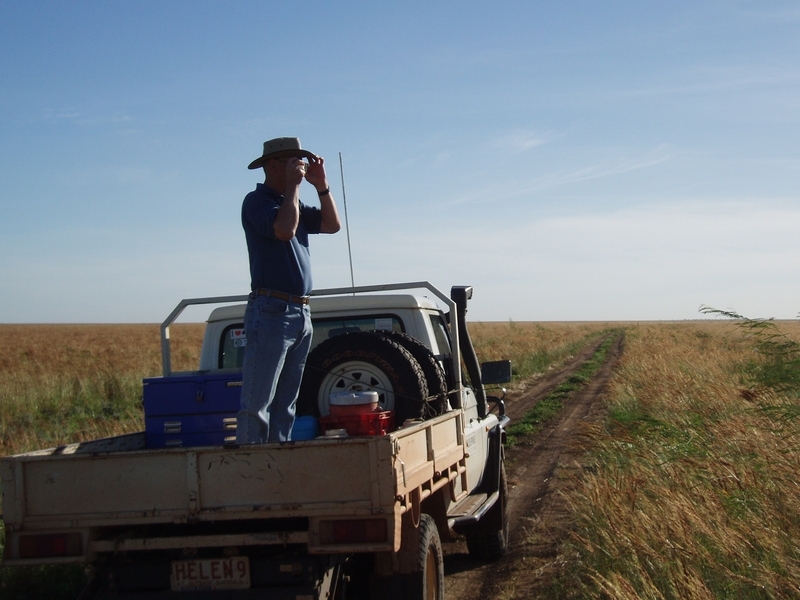 Ask him to describe how he does it and he will generally describe very convoluted ways of doing so without having any specific reference points for others to copy. 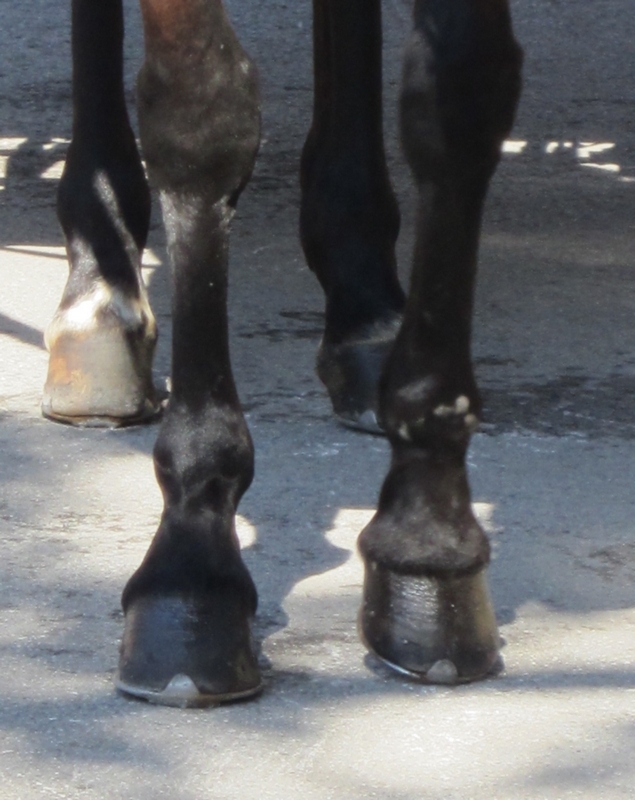 Is balancing a hoof a matter of trimming and shoeing so that it looks right? 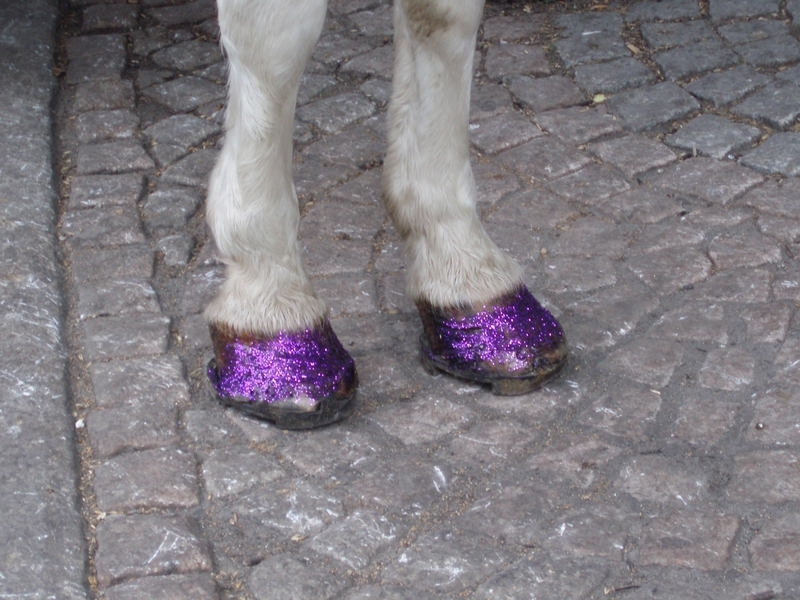 Is there a simple, prescribed method to balance the hoof? 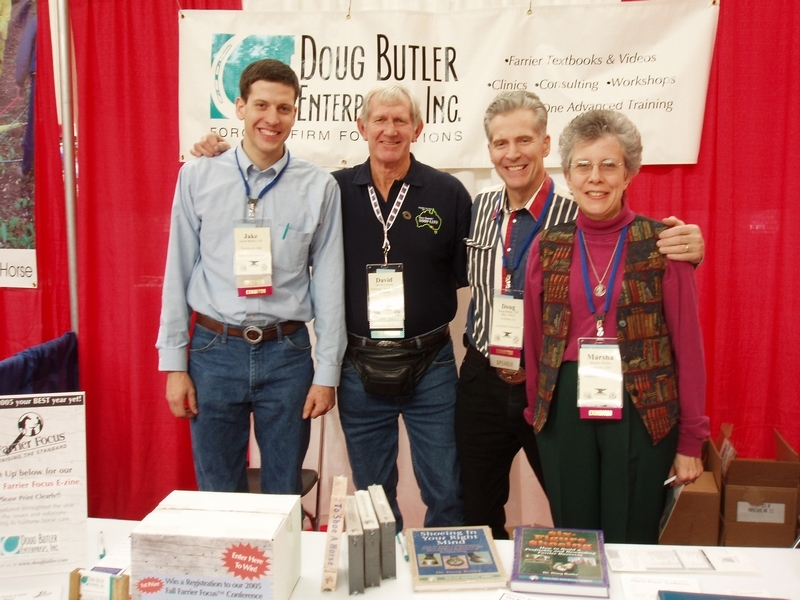 Can it be found in textbooks? 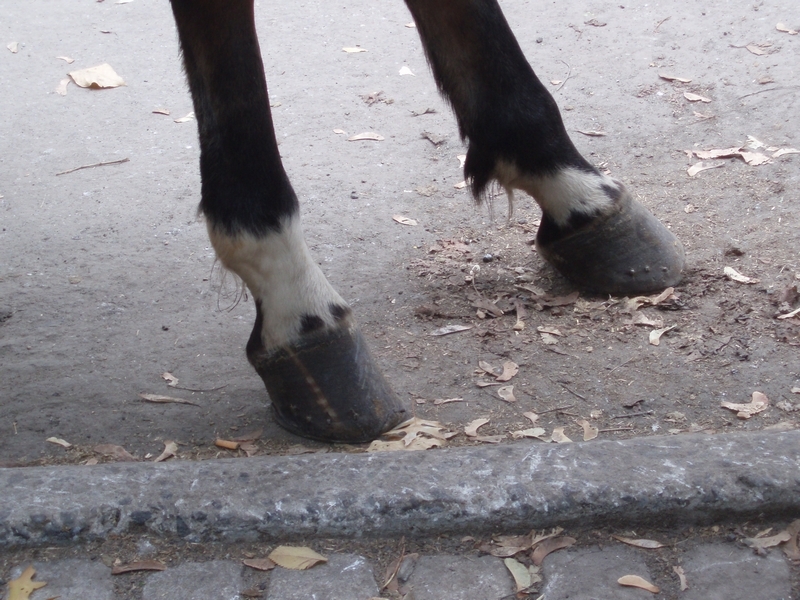 What is the method of teaching apprentice farriers to balance the hoof? 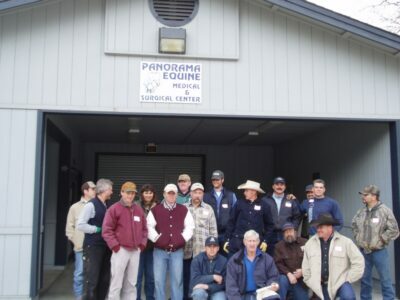 Do farrier schools have a standard method to balance the hoof? 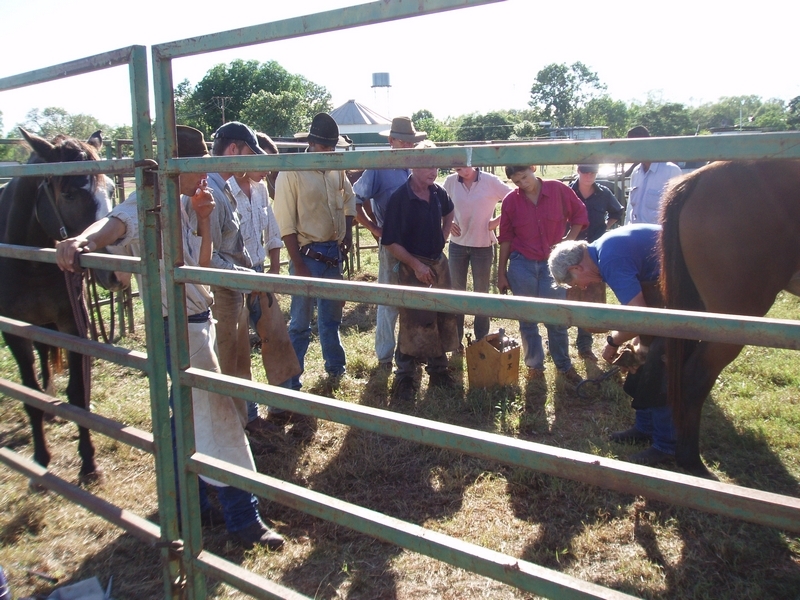 Surely we need to make it simpler for young farriers to learn the simple basics if we hope to encourage them to join the trade. 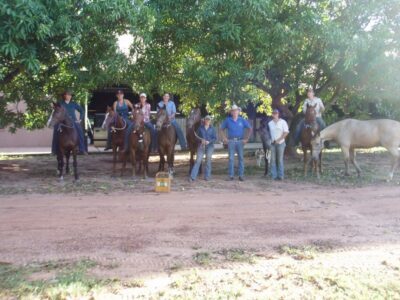 I have been shoeing horses for 52 years and teaching for six years and I have greatly simplified and developed my method of teaching in that time. 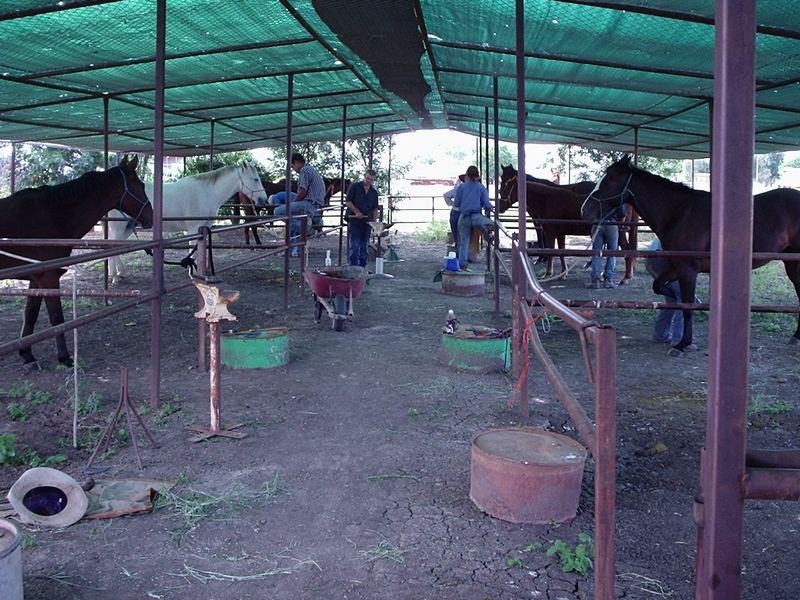 In the eyes of the academics and purists my teaching may not be their perfect method of shoeing, but it certainly achieves a very high degree of accuracy in a short amount of time while under the horse, and it enables the student to quickly understand what to look for and to solve the majority of problems. 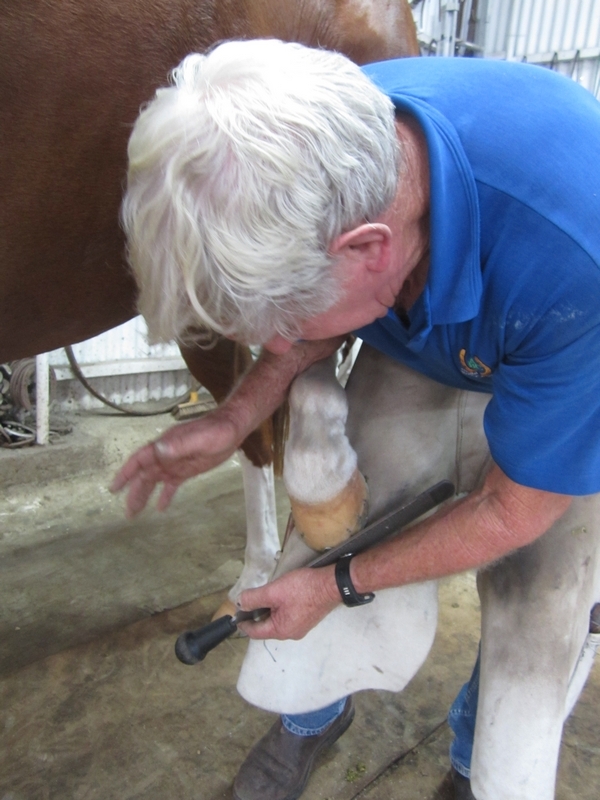 I have also developed a tool called David Farmilo’s HOOF-LINE to enable the balance of the hoof to be checked quickly and simply while under the horse. 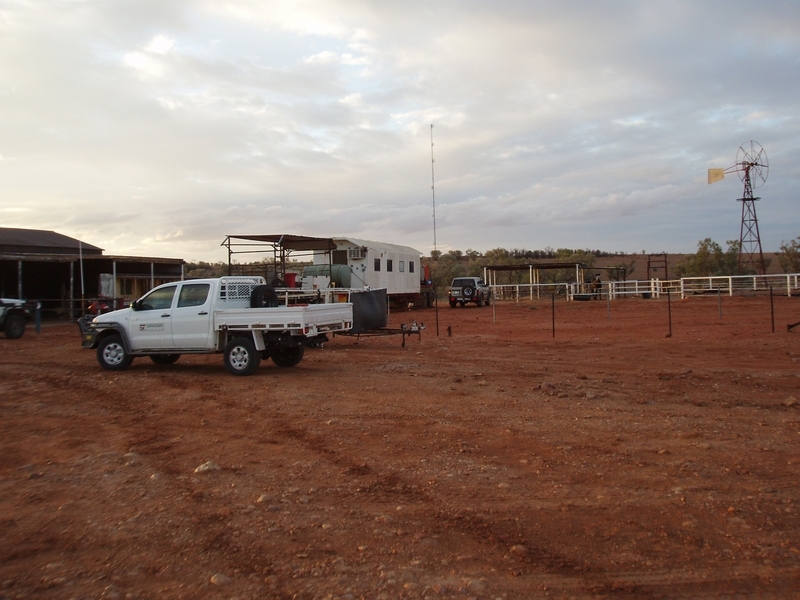 For those who deride this as a money-making exercise, you can go and get a strip of timber and make your own or you can buy mine – it’s entirely your choice. 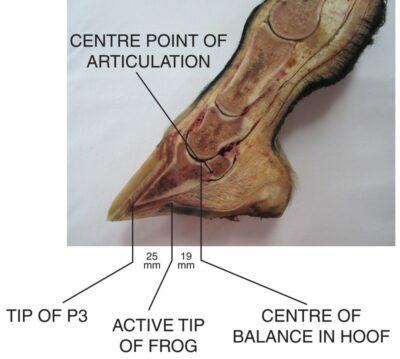 My centre of balance is 19mm behind the active tip of the frog. 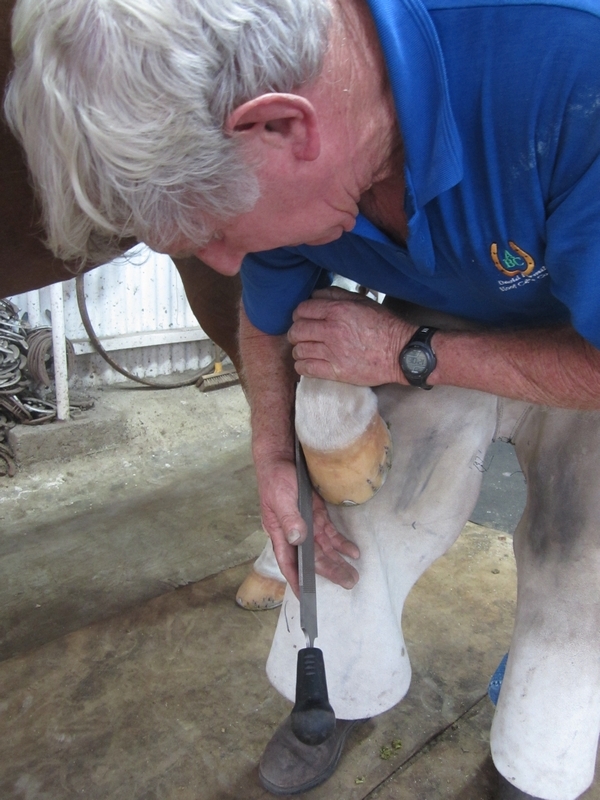 The measurement from there to the toe and to a line across the buttress of the heels should be equal when the hoof is trimmed in accordance with my prescribed trimming method. 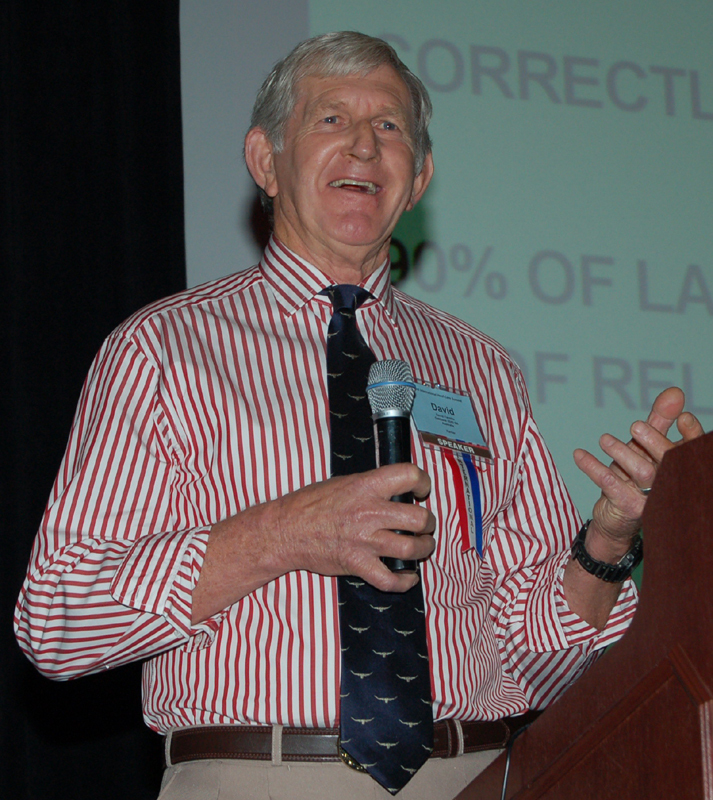 The medial/lateral measurement should also be equal, but not necessarily the same as the measurements from frog to toe and to the heel. 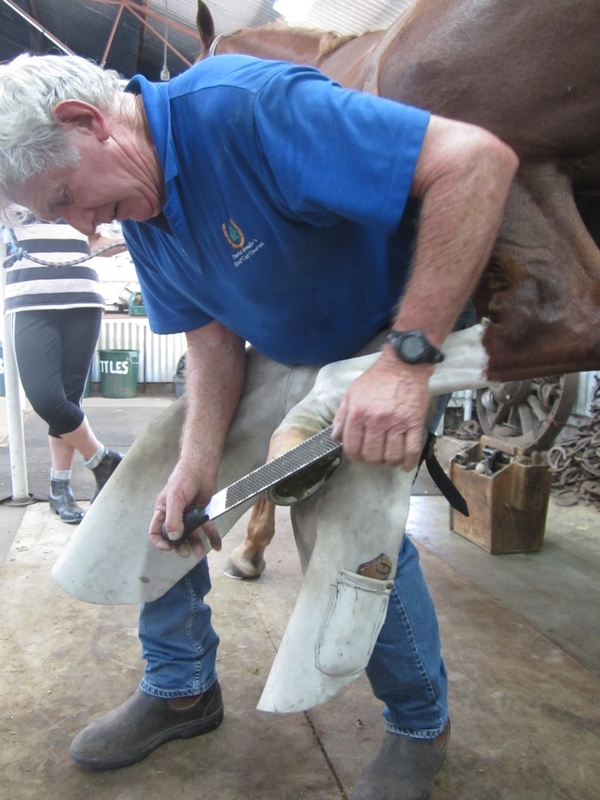 There was a simple and easy to understand method to trim the hoof. 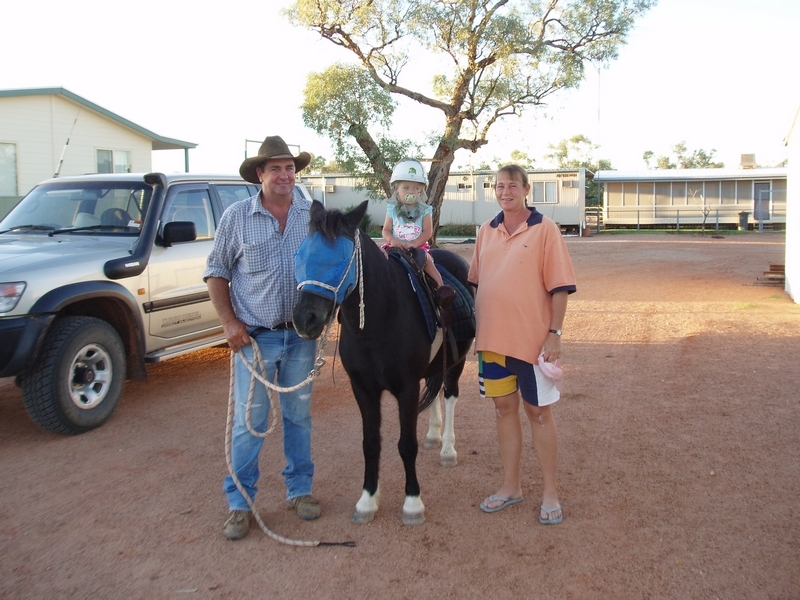 The method could be written down in simple language that didn’t need a lawyer to translate it. The method could be verbalised simply. 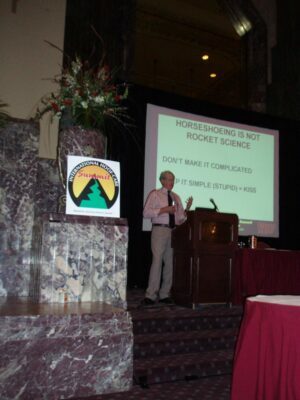 It could be understood and appreciated by farrier and horse owner alike. 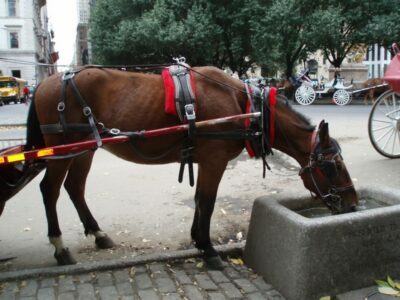 The method could be easily applied while under a horse. 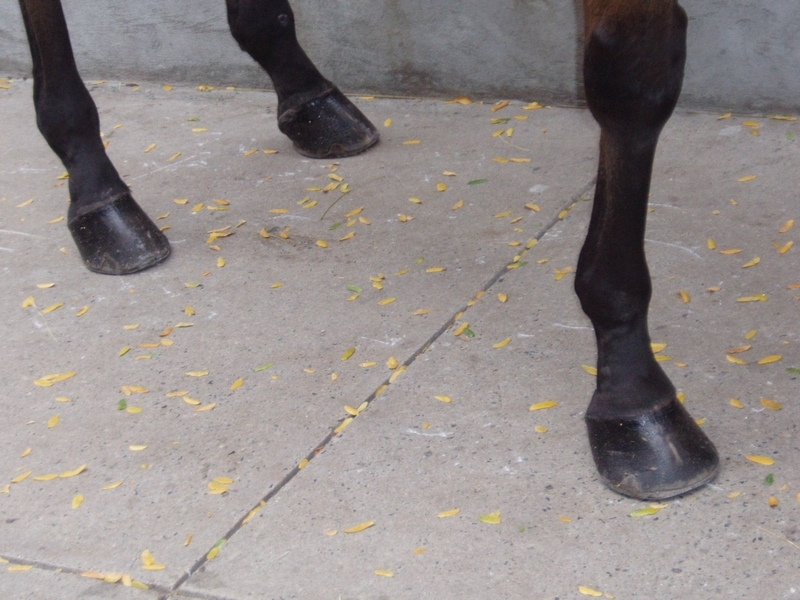 This simple method eliminates most of the hoof problems seen today. 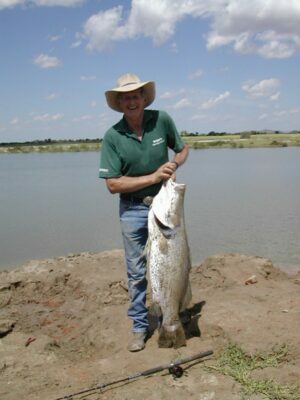 This is the method that I teach. 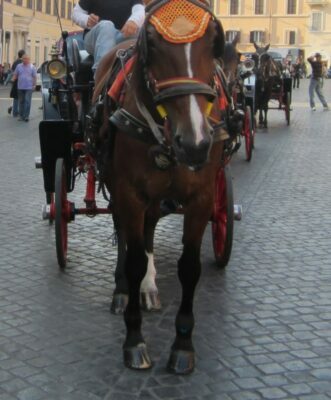 I make a policy of not using technical terms. 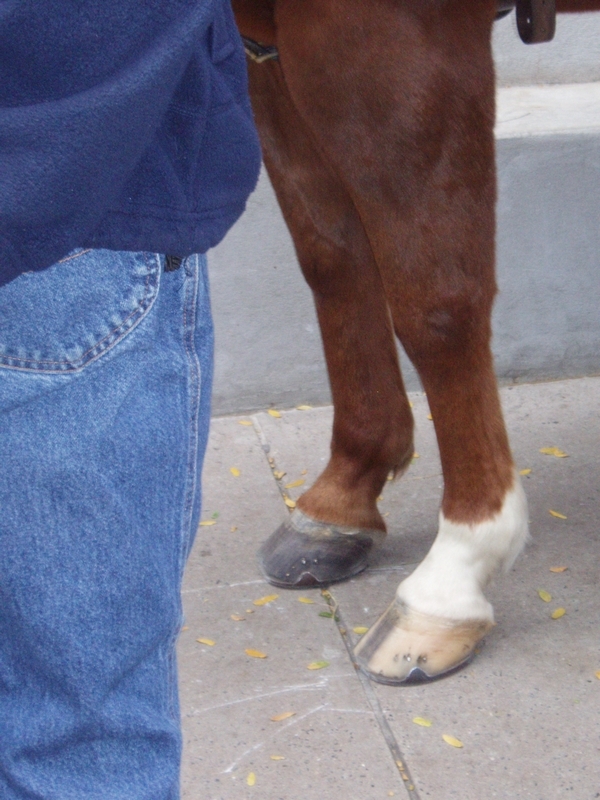 I also teach this method in conjunction with using my HOOF-LINE. 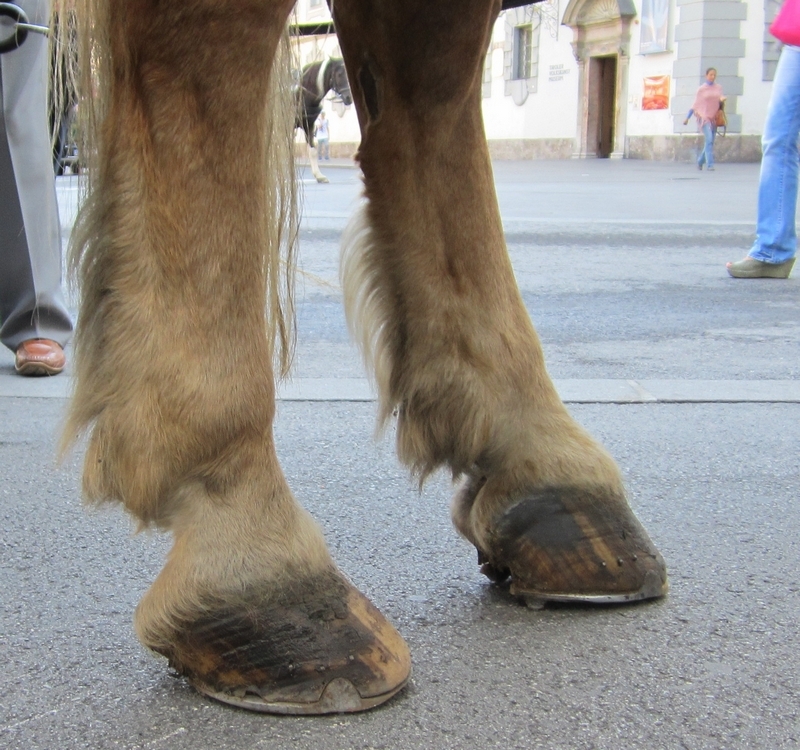 Observe the hooves and always start with the larger hoof (the dominant hoof) to avoid over-trimming the smaller hoof. 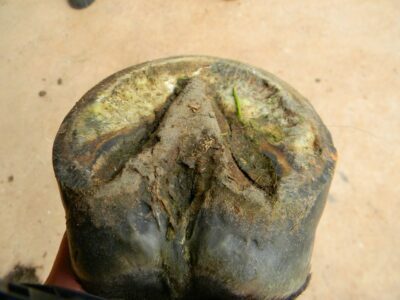 Clean out manure and dirt from the underside of the hoof with hoof pick. 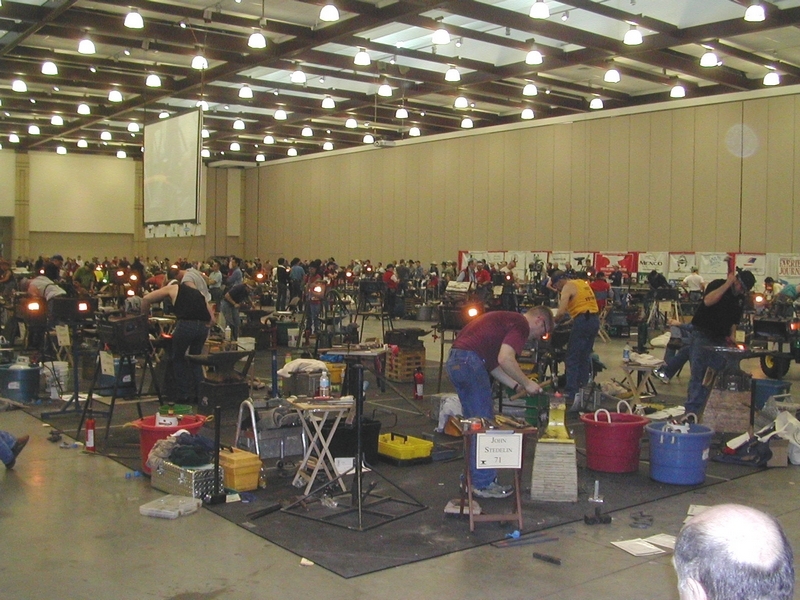 Starting at the tip, clean out the edge of the frog down to the bars, which identifies the natural frog/sole junction. 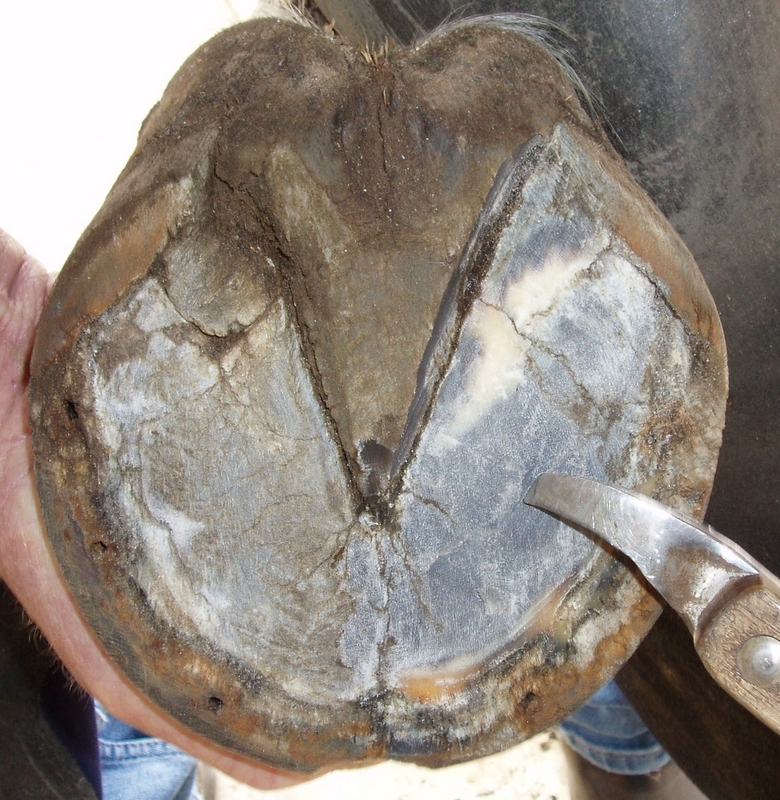 From there, working out to the hoof wall/live sole junction, remove only dead flaky sole to leave the sole as concave as possible. 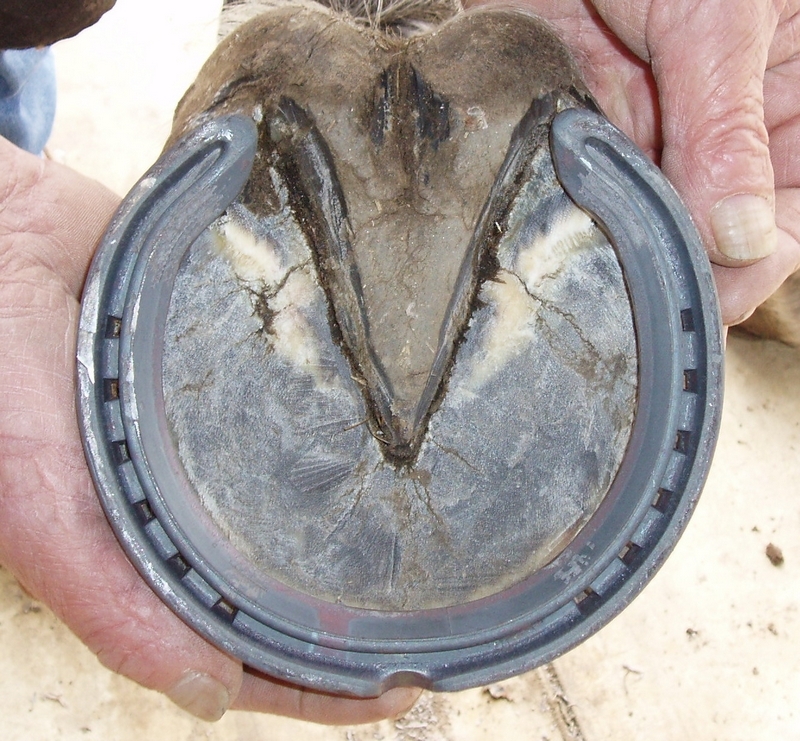 Remove excess sole ONLY down to the bottom of the fissure cracks, no further. 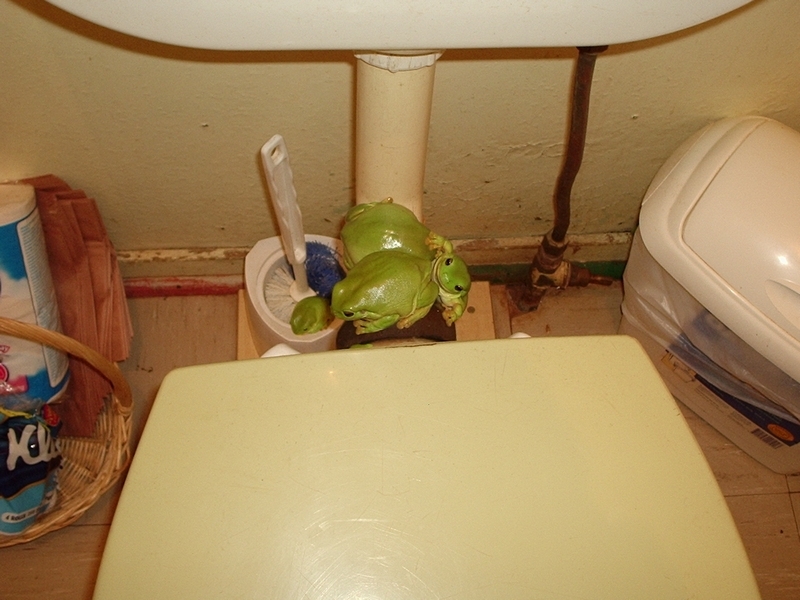 Lightly trim the frog with knife or nipper to an even V shape. 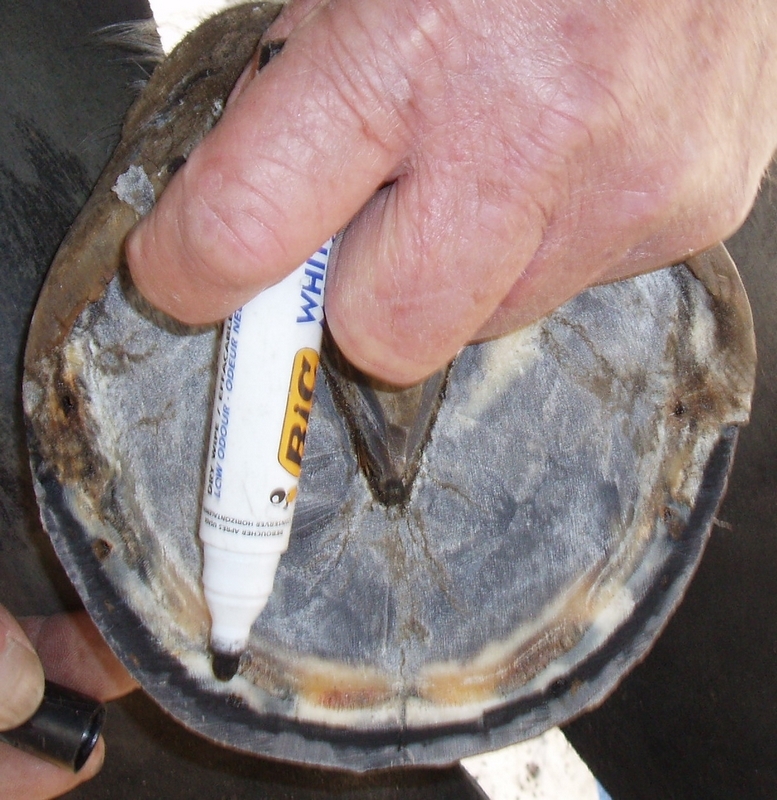 Then trim the tip of the frog to expose the junction at the active sole, thus exposing the active tip. Trim the bars of excess height and clean out the seat-of-corn area. 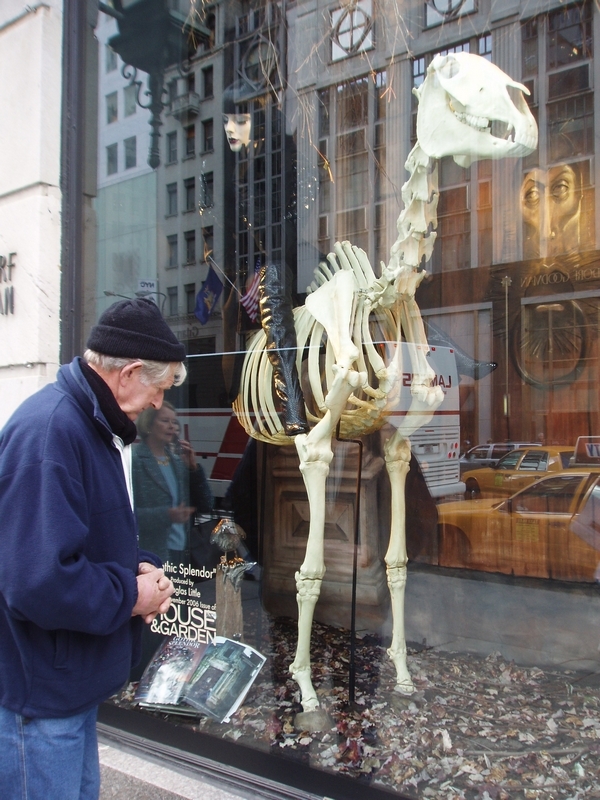 Place the HOOF-LINE on the tip of the active frog. The graduations will show the length to the toe compared to the length to the heel (at a straight line 6mm above the critical junction of the widest part of the frog across the heel buttresses). 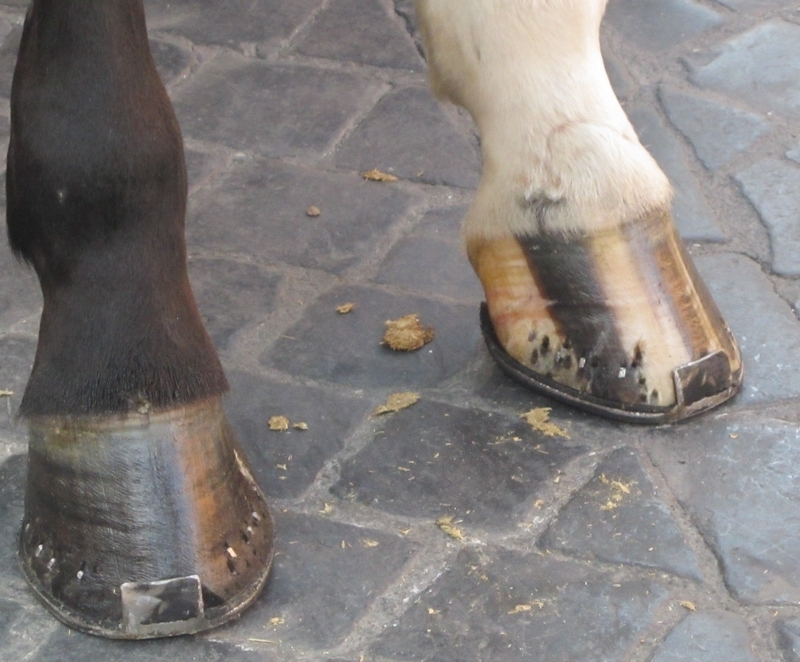 In the finished prepared hoof these two halves must be equal distances from the base of the triangle on the HOOF-LINE. Leave the heels untouched and, using a rasp or nippers, trim the front half only to a level surface to suit either barefoot (+4mm) or shoe fitting preparation. 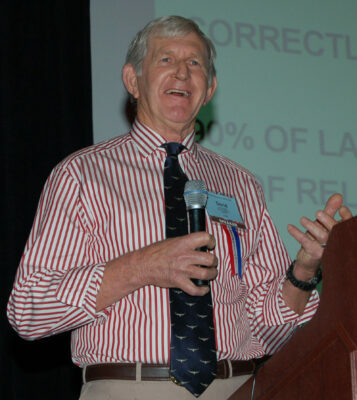 DO NOT OVER RASP! 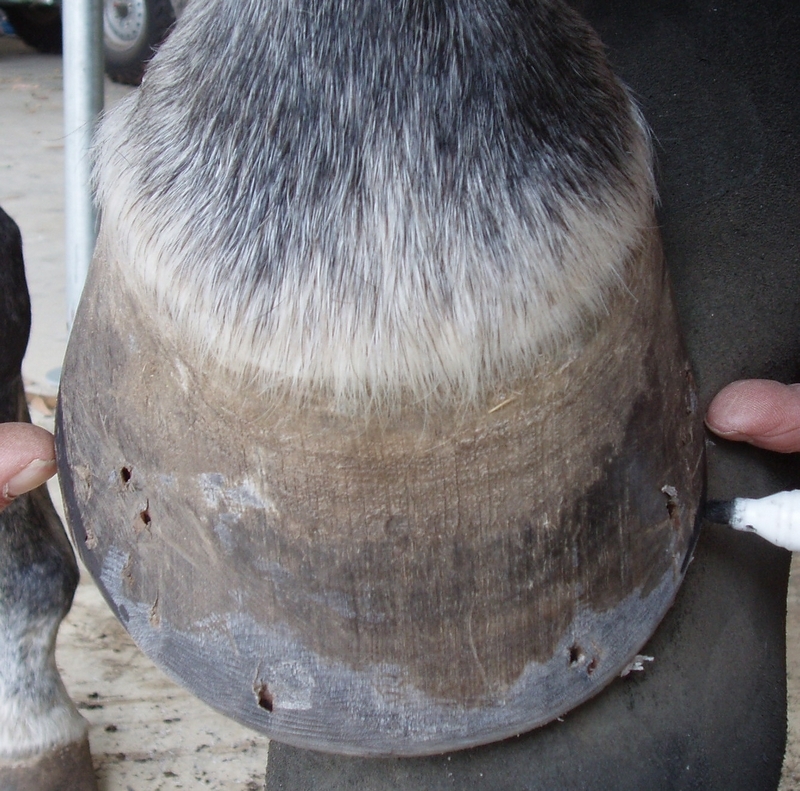 When the front half is trimmed and level, correct any thickening in the hoof capsule at the toe section only. 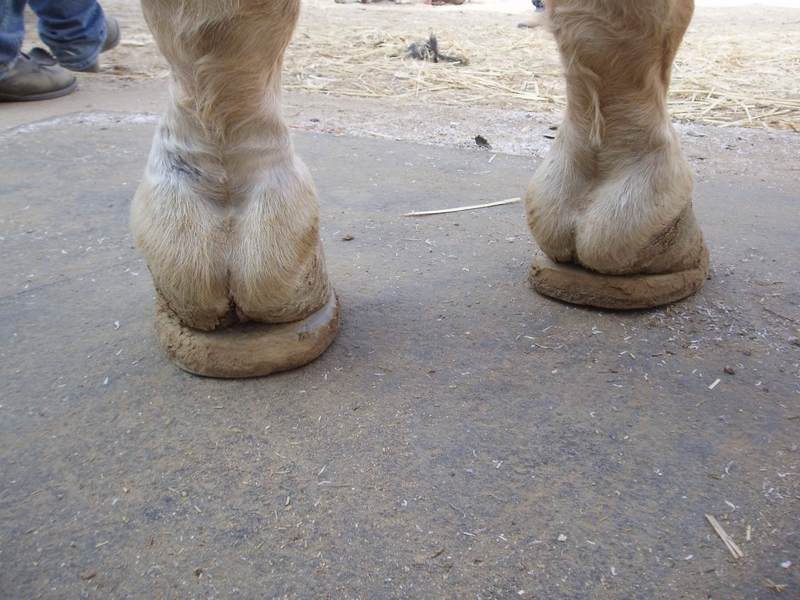 Uneven thickness is caused by flaring of the hoof in the toe area. 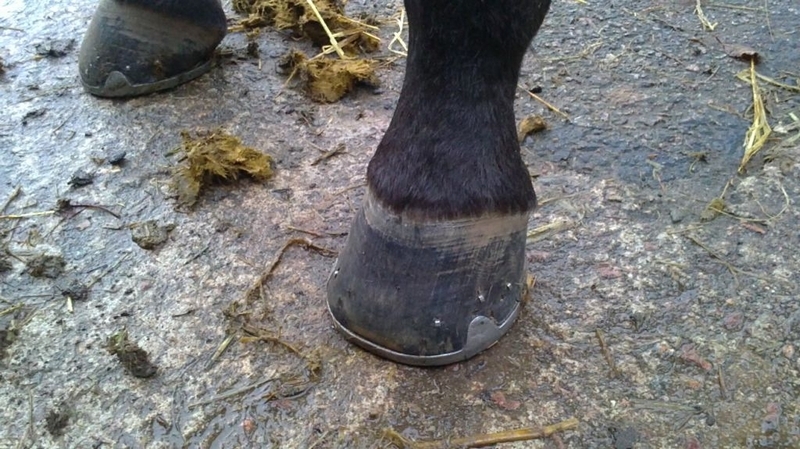 Bring the hoof forward on your knee or hoof stand and carefully rasp any flare away to copy the ideal or normal shape of the coronary band at the front of the hoof only, rasping no higher than the nail clinch area. 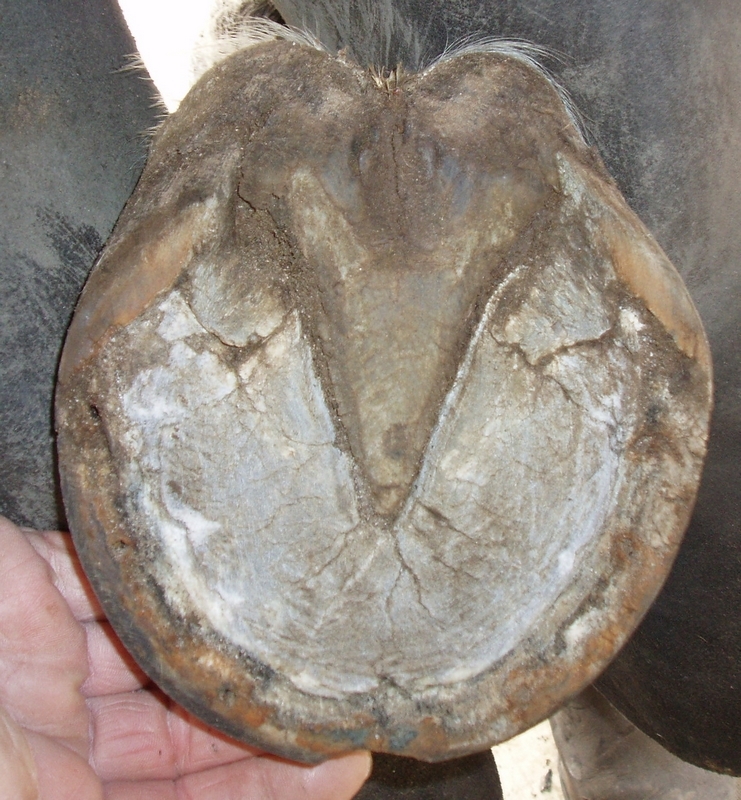 Check to ensure that an even thickness of hoof wall capsule around the toe area is maintained. 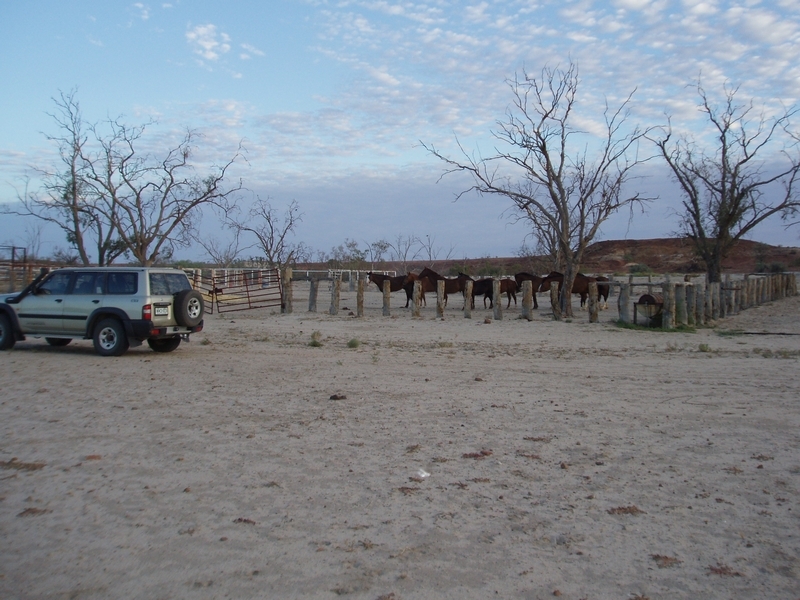 DON’T RASP EITHER SIDE OF THE HOOF WALL YET! 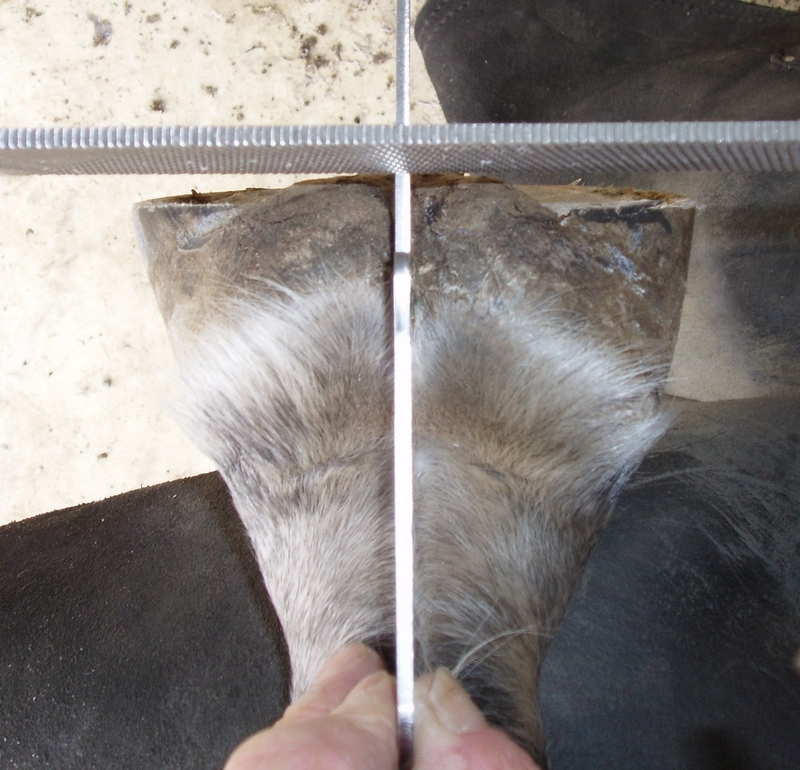 Using the HOOF-LINE, measure the length at the finished toe. 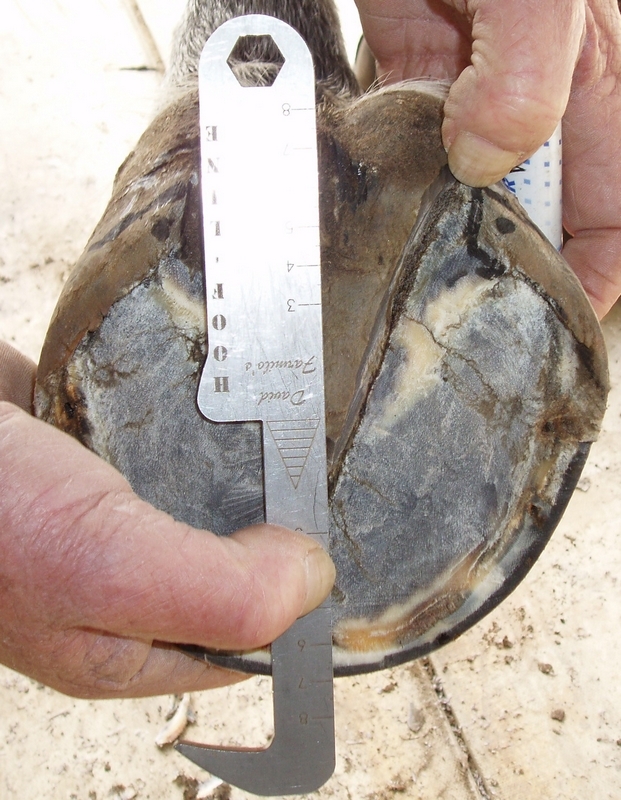 When the hoof wall capsule is prepared correctly, the measurement in the front half will then be correct; so use a marker pen to mark the same measurement to the heel (at a straight line 6mm above the critical junction of the widest part of the frog across the heel buttresses). 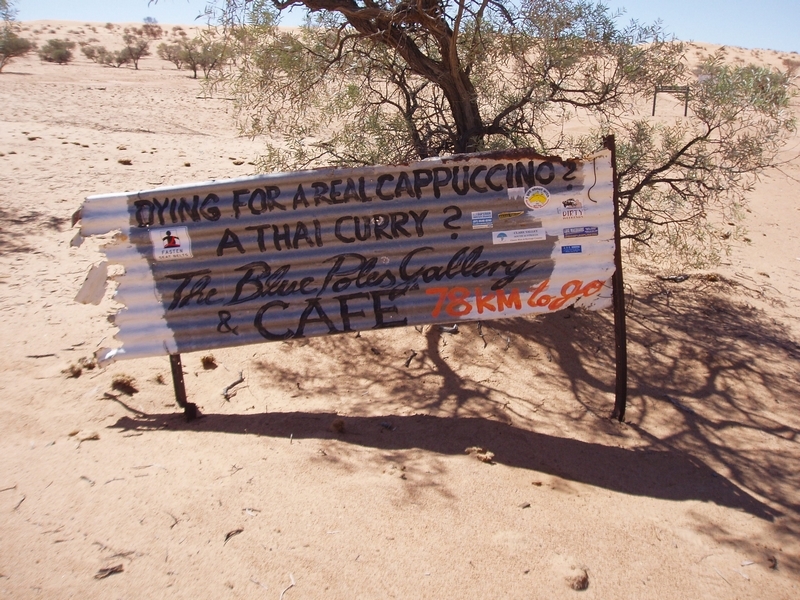 If it is already correct – leave it alone. If it is shorter, lower the heels to the marked level NOTE: Lowering the heels increases the length of the measurement to the heel. 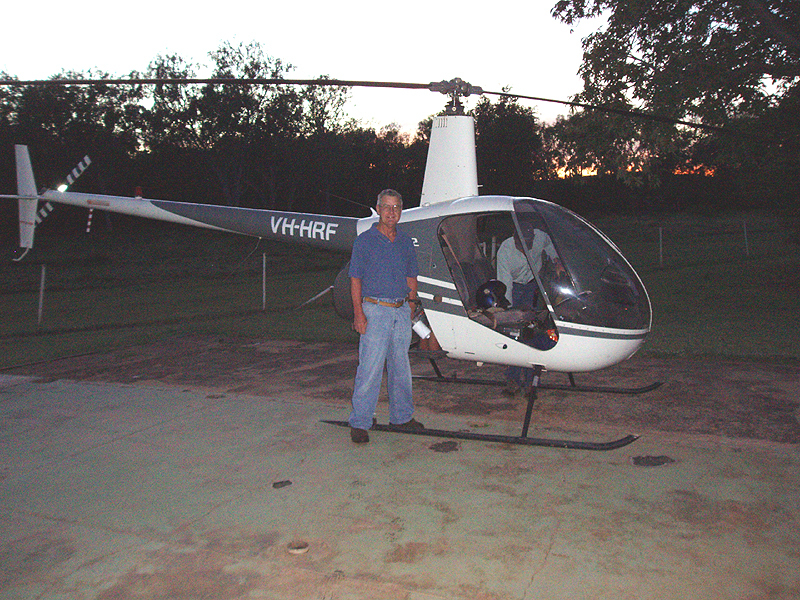 NEVER trim a heel to less than 6mm heel height above the critical junction at the widest part of the frog. Taking the hoof forward again, rasp the side walls and heel flares to copy the ideal or normal shape of the coronary band. 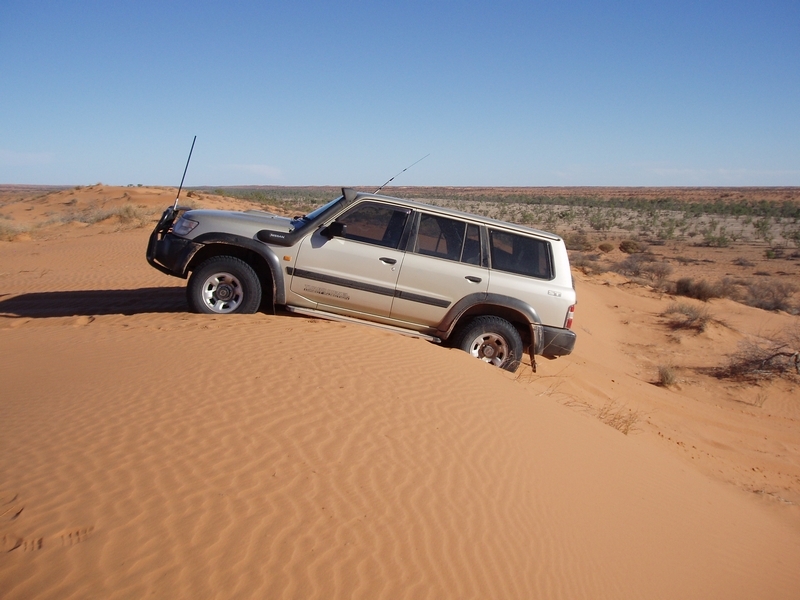 DO NOT OVER RASP. 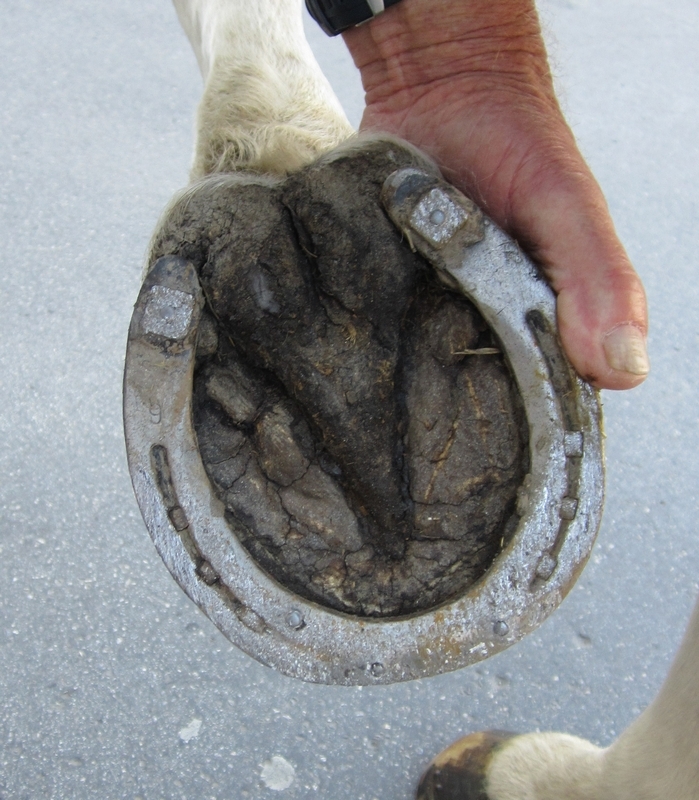 If the horse is to be left unshod, bevel the leading edges of the hoof wall slightly. 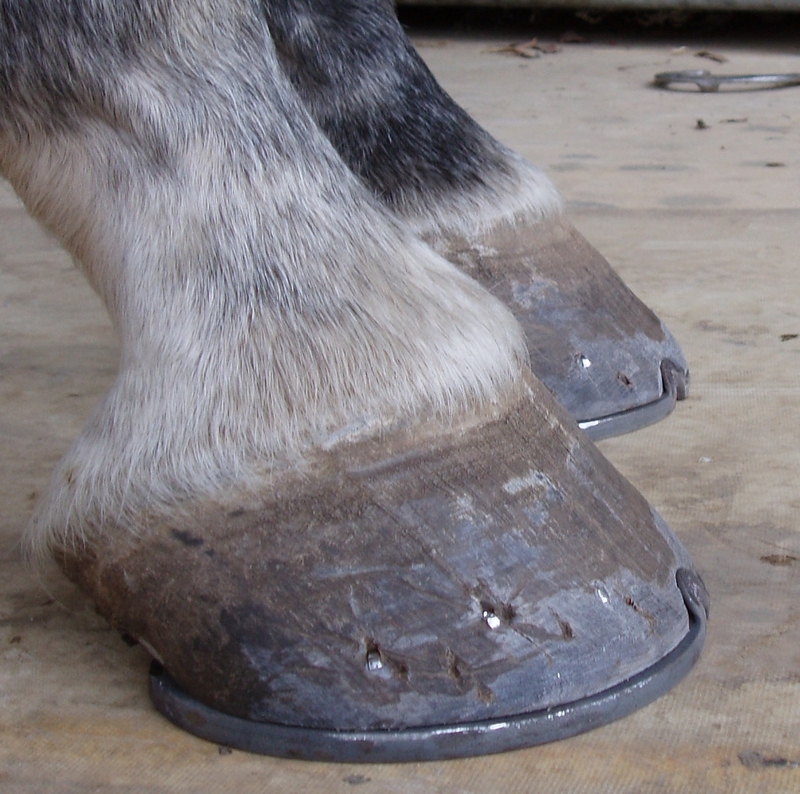 If shod, shoes must finish at the heel buttress to maintain correct hoof balance. 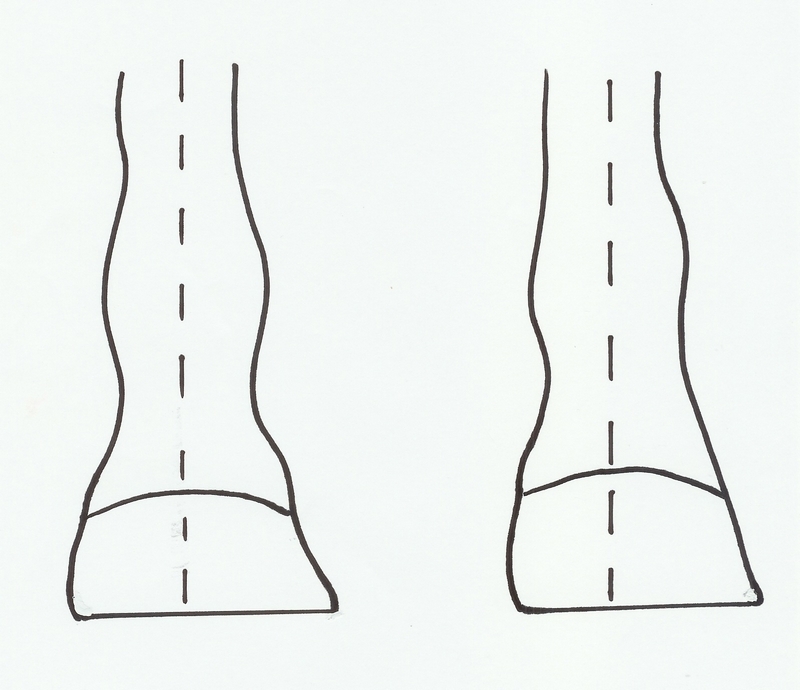 IF the toe is already the correct length, and there are no flares in the toe, the heel buttresses will usually measure too short, so by lowering the heels, which lengthens them, a balanced measurement will be achieved. 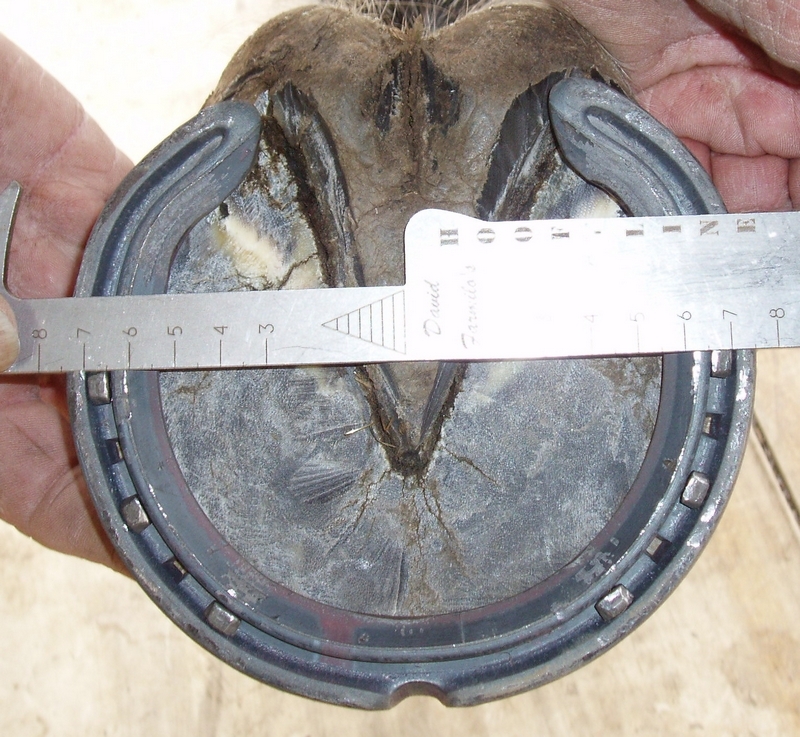 When this balanced measurement is achieved in the bottom of the hoof, the front of the hoof wall is parallel with the pastern angle, the hoof shape is a mirror image of the coronary band, there are no flares in the hoof wall, and the hoof is stress free. 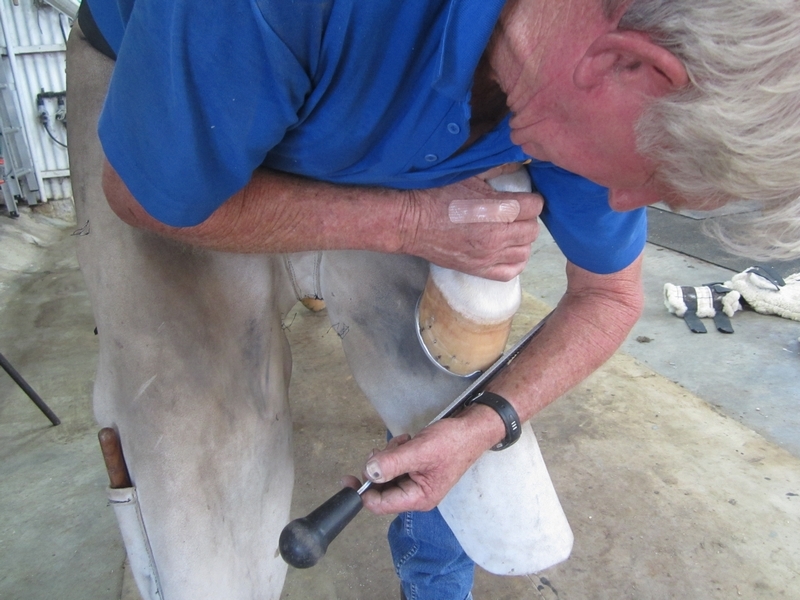 Following this method gives you the ability to consistently duplicate an efficient method of achieving a correctly balanced hoof. 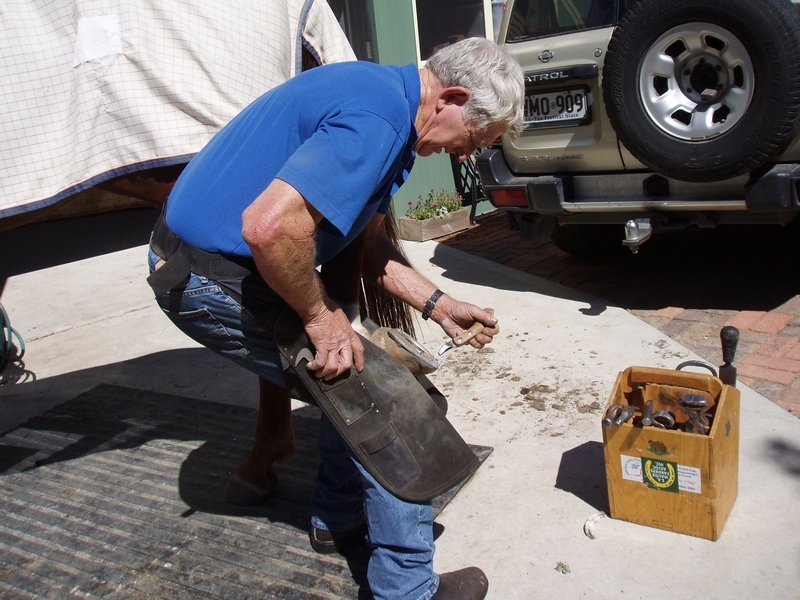 In some extreme cases, it may take two or three shoeing periods to achieve balance, but that same horse may have been out of balance and in pain for years. 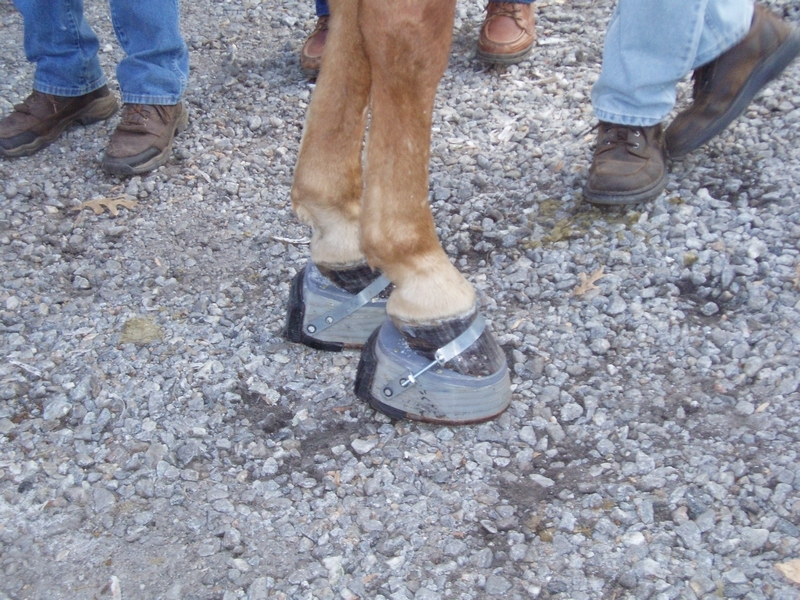 The HOOF-LINE used in conjunction with my trimming method helps eliminate lameness by correcting long toe/low heel problems, or high heel/ short toe problems; it eliminates flares which are a major cause of instability in the hoof; it helps correct contracted heels, which are the result of minimal frog contact, and also eliminates the need for remedial shoes which often exacerbate the problems. 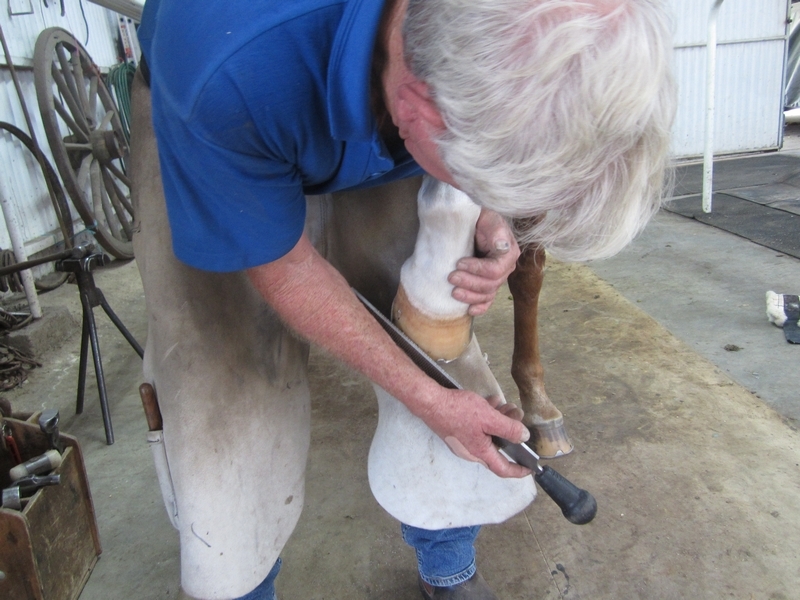 It even saves further time by allowing the farrier to take the HOOF-LINE measurements to the anvil and shape the shoe according to the measurements of the finished hoof. 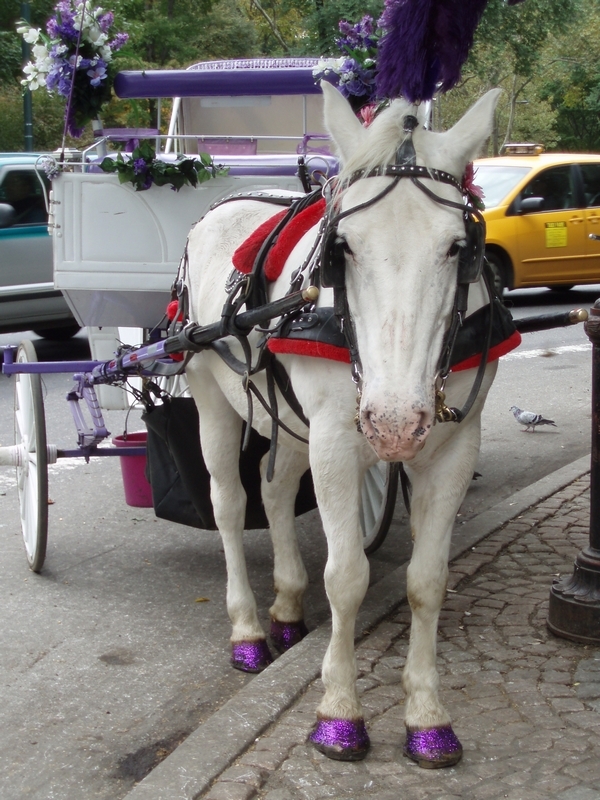 The major advantage is that this method takes the guesswork out of hoof preparation. 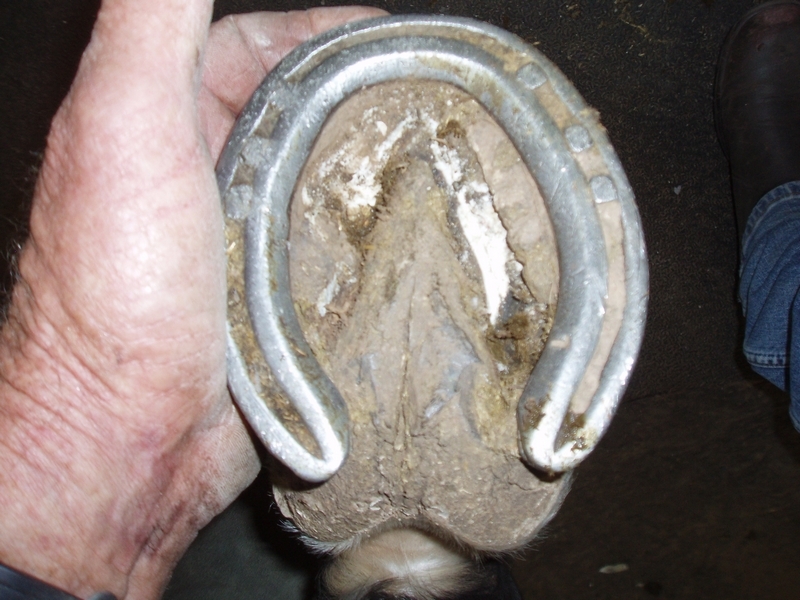 The process is of course dependent on the user preparing and measuring the hoof correctly, and no responsibility or liability is taken or implied.